Along with dragonflies, butterflies are my favourite insects. I believe one day I will be able to admire spiders but for now they just make me shiver. Imagine my suffering being a country girl: lots and lots of spiders for me to scream around… Well at least now I don’t scream: I jump. In silence. The silence part is very important :) It’s still an over reaction but improvement is improvement! 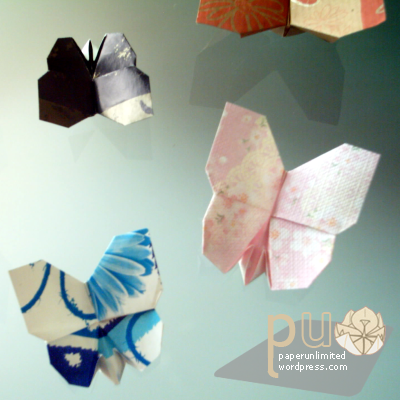 And coming back to origami: these butterflies were diagrammed by 川崎敏和 /KAWASAKI Toshikazu. 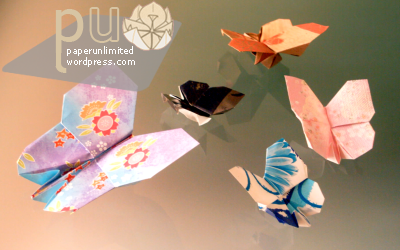 They can be found in 折り紙夢WORLD花と動物編 /Origami Dream World, Flowers and Animals volume. 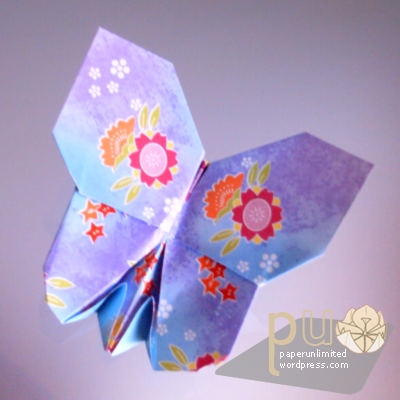 These butterflies are made with 1×2 ratio paper, or simply put: half of a square. 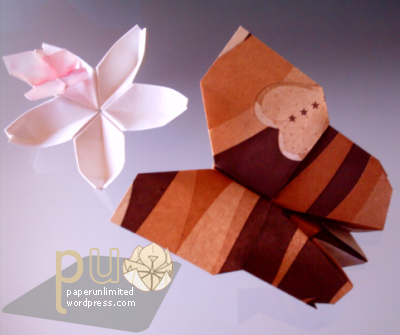 *origami purists tremble with horror… Ehehe* It’s very easy to do. Actually I have much more done, you’ll see some more after this text. The brownish one was made from 9x18cm / 3.5×7″ rectangle of wrapping paper and ended up with 9x10x1cm /3.5x4x0.5″; the flowery one changed from a 7.5x15cm /3×6″ to a 7x8x0.8cm /2.8×3.1×0.3″ and was made from double faced origami paper (blue on one side, flower prints on the other). Finally the smaller and pinkish butterfly was made from stiff semi-transparent paper of 3x6cm /” that resulted in a 3.2×2.8×0.3 cm /1.3×1.1×0.1″ butterfly. This entry was posted on 2007|08|24 at 14:24 and is filed under origami. You can follow any responses to this entry through the RSS 2.0 feed. You can leave a response, or trackback from your own site. Very nice origamis. Do you happen to have the folding instructions for this particular origami? hi, i love the butterflies you made! :) would you be so kind as to share on how to do it please? thank you! can i have the steps to follow please please please? This post is so old… I don’t know if I will be lucky to get a response, but I’d LOVE to get a diagram of this cute butterfly… please? Hello everybody…! lets try this site.. nice to meet u from Indonesia! You can also request diagrams on my website!